We’re going to make our own Christmas ornaments! I just taught my sister beadweaving and she’s liking it! You can do it with your sister too or mother or even a friend. 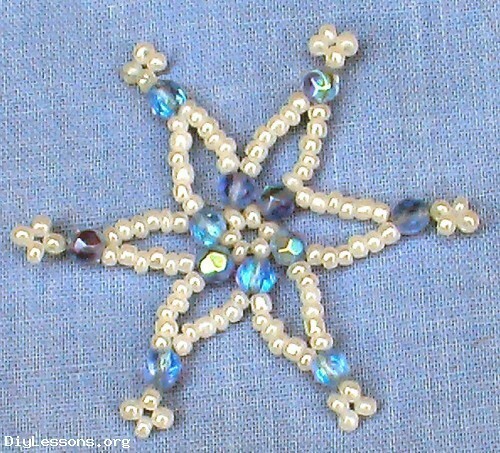 Here are some beadweaving patterns for a cane, star, snowflakes, beaded bead and a Christmas tree Christmas ornaments. These lovely Christmas ornaments were beaded by Margaret Greeney and Louise Gugliotti of Launceston. Both patterns come from Jill Oxton’s book no71 .They sit onto a shelf or mantle and are oh so cute.I have put these little delights on my to do list. Pipe cleaner and craft beads go hand in hand. If my kids need something to do, I pull out the container with these two supplies. They’re easy for little hands and the beads stay put on the pipe cleaner. Here we made Christmas Ornaments out of pipe cleaner and beads. They’re super simple and add some homemade charm to our Christmas tree. From ornaments that look like candy, to beaded Christmas ornaments to make, to homemade Christmas ornaments that look like Santa and angels, you have an array of simple homemade Christmas ornaments to choose from! 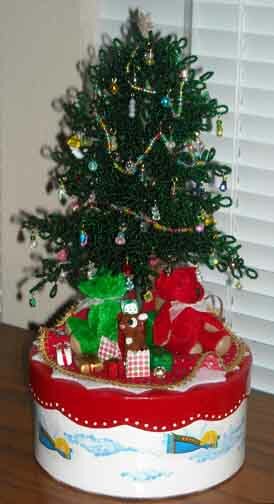 This beaded Christmas tree is a work of art that will be treasured and handed down for generations to come. This tree project is not for the beginning beader. However, all the expense and work that goes into this tree will creating a lasting family heirloom.